Fall in love with the great outdoors on Harvard real estate. At the Oxbow National Wildlife Reserve, over a thousand acres wait to be explored and appreciated. Declared as “a place set aside for wildlife, Oxbow is a place where a visitor can witness the diversity of the natural world”. Paths wind through the wilderness curving along the banks of the Nashua River, around oxbow ponds, streams, wetlands, fields and forests. Getting back to nature has never been easier. Those who want to be in the thick of things can set out on a two mile hike beginning at Still Water Depot Road. Benches are strategically scattered about for moments of reflection, settling in for a good read or just catching one’s breath. A canoe launch is at the ready for canoers and kayakers itching to float about on the river. Fishing on the Nashua River is allowed on the shores and from the vessels. Anglers living in Harvard are often successful reeling in large mouth bass, yellow perch, sunfish and brown bullheads. Any season in the reserve is picture perfect. In the winter time plenty of cross country skiers and snowboarders enjoy the pristine scenery. As expected wildlife flourishes on this protected piece of Harvard real estate. Visitors ready to observe often spot white-tailed deer, eastern coyote, cottontail rabbits, gray squirrels, American toads and common garter snakes. The blue-spotted salamander is an excellent find as is Blanding’s turtle which is rare to the area. Bird watchers are truly in heaven with the amount of migratory birds flying by. 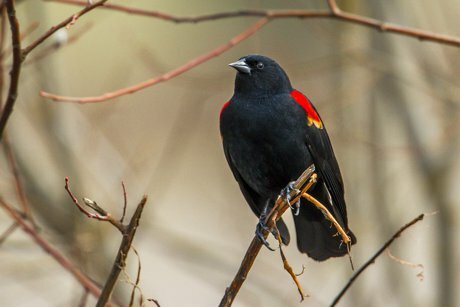 Feathered friends may include the red-winged blackbird and gold finch. Check out a listing of potential species to see here. Wildlife is most active at sunrise and sunset. Being quiet is key and more successful sightings are experienced when the weather is cool.